Ooh this was a book that quietly drew you in and then 'BAM!' pulled the rug out from underneath you. I was happily reading along, learning about the the lives of two couples: Rachel (on the edge of crazy) and her husband David and Adam (a desperately shattered and lonely man) and his wife, Julia. I loved the way that the first part of the book was set out with a chapter for each of the four characters before merging in spectacular fashion in part 2. Rachel scared me from the start. She is clearly verging on unhinged and I worried about what she could be capable of in a potential moment of madness with two young children in the house. Rachel's husband, David, doesn't sleep in the same room as her as Rachel is a restless sleeper. Obviously this has a disastrous effect on their relationship and David's eye begins to wander. It is clear that he does love Rachel but he's not quite sure how to reach her. That's when the story takes on a slightly darker tone and obsession takes the driving seat - I thought absolutely anything could happen in the last quarter of the book. Think Fatal Attraction bunny boiler and you'll be near where my mind was going. It was actually a sobering thought for anyone who has 'met' somebody on the internet. You never quite know who you are talking to and how much of your life you are giving away. We must leave so many clues to our whole existence on the internet and all it takes is somebody with a mindset to follow the clues and turn up at our door - YIKES! 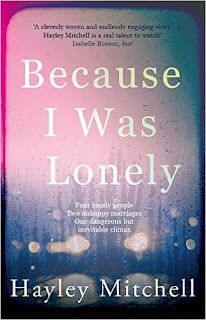 I really enjoyed the way that this book was written in two very distinctive parts - it really gave us a chance to get to know the characters and build a full picture of their thoughts and feelings. I felt so much emotion for Adam, being stuck at home and feeling so much guilt - as human beings, we do like to beat ourselves up but this is the point at which we are vulnerable and a chink in the armour can let a psychopath into our lives. You never really know what's going on in someone's mind and it was actually really frightening to see how something could be harmless to one party but meaningful to another. 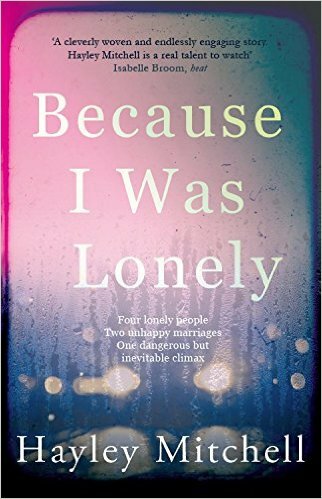 Because I Was Lonely is such a fascinating book that I have thought about it long after I turned the last page. In this digital age, where we all leave unknown fingerprints, virtual can quite quickly become reality. An addictive book and one well worth reading. I chose to read an ARC and this is my honest and unbiased opinion. 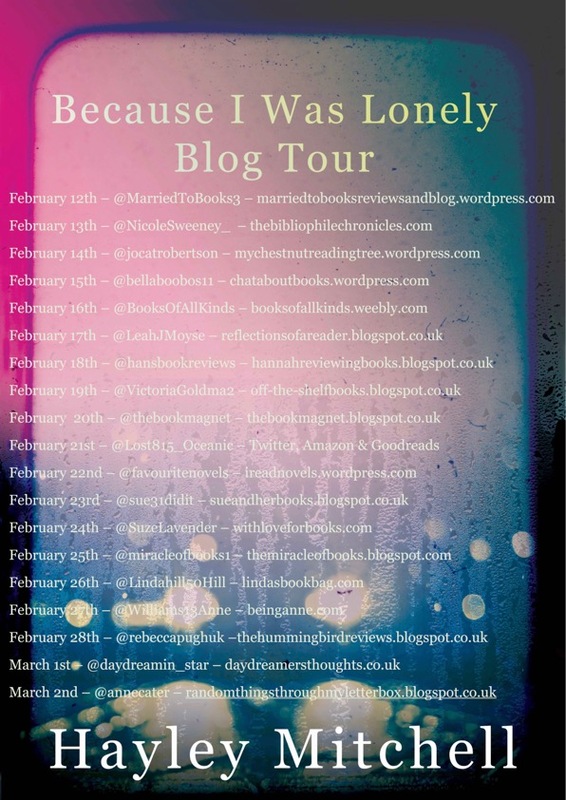 I am releasing my review as part of the blog tour.